We’re Live: All New Ruff! Everyone’s favorite canine returns this week to star in THE RUFF RUFFMAN SHOW, an all-new short-form animated PBS Kids multiplatform series designed to help kids ages 4-8 learn core science concepts through videos, a new website with digital games, a new photo app, and hands-on activities as part of the Ready to Learn grant program from the Department of Education. In each video, Ruff, along with his assistants Blossom and Chet, answers questions from real kids, takes on challenges, and learns the value of perseverance—all while modeling science inquiry skills. All 20 videos of the show are available on PBS Kids digital platforms, including the free PBS KIDS Video App and pbskids.org. The videos roll out on the PBS Kids YouTube channel has begun, and segments from the series are airing on the new PBS Kids 24/7 channel and live stream this fall. 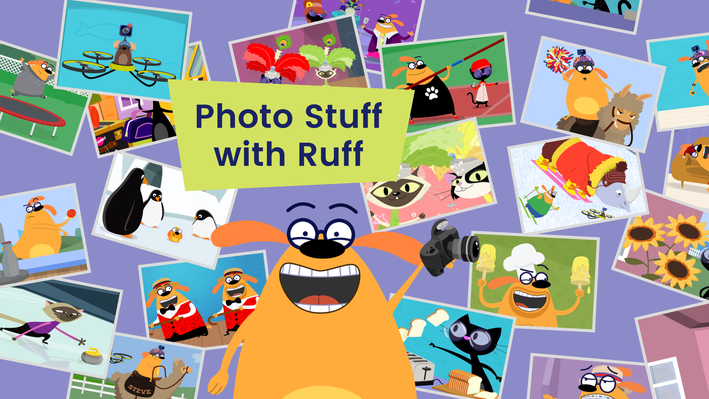 The free app, Photo Stuff With Ruff, is available in the main app stores. Resources for educators abound at PBS LearningMedia. Many were involved including Carol, Marcy, Jess, Nicole, Mia and Deb on the animation side with many more on the digital side: Bill, Melissa, Kit, Tara, Anessa, Elizabeth, Gentry, Louise, Jesse, Stefan, Sophie, Elles, Carlyn, Jolin, Kal, Colin, Kevin, Jay, Ken, Carl, Alan, Glen Berger, and Jim Conroy. Bill’s latest piece in Kidscreen. Ruff goes green with help from The Keneda Fund. From the very talented Mr Jeff Bartell.